AN EFFICIENT SEAPORT, A CHANNEL TOWARDS GLOBAL INDUSTRILIZATION…MD, NPA. The Managing Director of Nigerian Ports Authority (NPA), Hadiza Bala Usman has informed all relevant Stakeholders in the Maritime sub Sector and the general public of the readiness of Management at investing resources in the area of Capacity Building and an efficient Port system towards the growth of the nation’s economy and global industrialization. According to her, Developing Nations of the World have come to the realization that Industrialization is a channel through which a nation’s economic recovery short and long term is dependent upon. To this end all hand must be on deck by all concerned towards finding a long lasting solution to these perennial problems facing our nation in the area of starvation, diseases and unemployment amongst others. Hadiza made this remark at the NPA’s Special Day during the ongoing 2017 International Trade Fair organized by the Lagos Chambers of Commerce and Industry at the Tafawa Balewa Square Lagos with the theme ‘’Promoting Industrialization For Economic Recovery And Sustainable Growth’’. According to the NPA helmsperson who was represented by the General Manager Corporate and Strategic Communications, Abdullahi Goje, Management is assiduously working towards making our seaports a safe haven for Investors within the sub-Sahara Africa by providing a conducive environment for all in line with International best practices. In her welcome address, the President of the Lagos Chamber of Commerce and Industry (LCCI), Dr. (Mrs.) Nike Akande (CON) lauded the contributions of the Port Industry to the growth and development of the nation’s economy, and called on the relevant Government Agencies to ensure an enabling environment for an efficient Port system. She noted further; “The Ports are critical to the economic life of this country and this makes it imperative that Agencies managing the Nation’s Ports and Maritime Infrastructure must continually work towards a better regulatory and operational environment that guarantees Ports efficiency across the Country. The issues around Port Operations are well known by the Agencies concerned with Port Management in Nigeria and we acknowledge the efforts of Government towards improving the efficiency of the Ports’’. 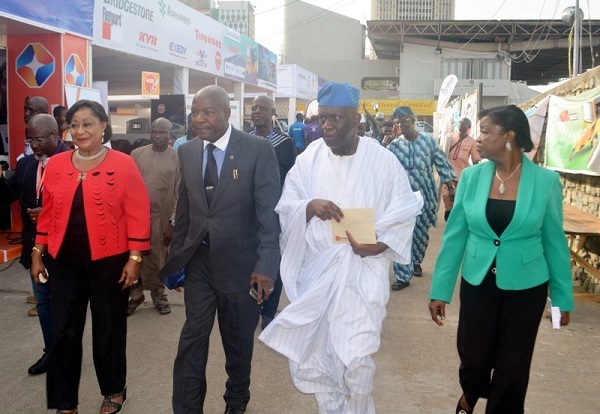 In his speech the Chairman, Trade Promotion of the Lagos Chamber of Commerce, Mrs. Sola Oyetayo charged all Stakeholders to ensure a total rejuvenation in their policies in the area of 24 hour Port Operations in the Ports, 48 Hours Cargo clearance at the Ports including improvement of traffic within the access roads amongst others. He commended the Managing Director for her passion towards the participation of NPA at the fair and that NPA participation has been adding value to trade promotion over the years. Exhibitors at the 10 day event were drawn from Local and International companies from China, Egypt, Japan, Ghana, India, European Union, Indonesia, Pakistan as well as local and medium scale entrepreneurs. Highlight of the occasion was the presentation of plaque of recognition to the Managing Director for her contributions to the development of Nigeria economy in the Maritime sector. The NPA Management was duly represented by the Assistant General Managers, Corporate and Strategic Communications and Port Promotions I.A Suwaid, I.S Nasiru Media communications and Protocol while on the LCCI delegation had on its team the Deputy President Mr. Babatunde Rowase (FCA) as well as the Chairman Trade promotions Board Mr. Sola Oyetayo.